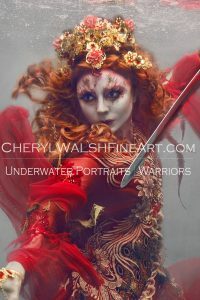 Recently, Mather had the pleasure of once again collaborating with Cheryl Walsh and Alta DeKoven on another underwater shoot. This time, Mather paid homage to her Czech heritage and its incredible Firebird myth, lovingly designing the couture robe she is wearing from scratch. The image is called “Pták Ohnivák”, and is dedicated to the memory of her grandmother. 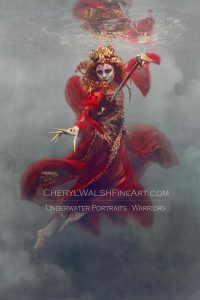 With very special thanks to Todd Walsh for safety! This entry was posted on September 6, 2017. It was filed under Uncategorized.